Note: This is a reprint of my review for Our Brand Is Crisis, which originally ran on September 13, 2015 after seeing it at the Toronto Film Festival. I am publishing it again today as it hits theaters this weekend. Our Brand Is Crisis is a Grant Heslov/George Clooney production, but it's not Argo in the sense that it's not a political thriller and it's not Monuments Men in the sense it's not a heroic story parading around as a nostalgia trip. As this is a David Gordon Green picture though, this is a film that ends up being something of a mashup between a political drama and slapstick comedy. Green is an eclectic director who has dipped his hand in heavy drama (George Washington, Snow Angels) as well as broad comedy (Pineapple Express, The Sitter) and his latest somewhat blends these two styles to create something uniquely edgy if not completely conventional in the beats it hits. From the outset, Our Brand Is Crisis feels like a straightforward documentation of the carousel of politics this world and it's countries become wrapped up in every four years. Given this is Green we're talking about it also means the characters involved in such circumstances have a unique set of sensibilities that give the otherwise unsurprising narrative a twist. Early on in the film Sandra Bullock's 'Calamity' Jane Bodine tells a room of campaign volunteers they need to help make the narrative fit their candidate rather than the other way around. Green seems to have heeded his films own advice as he clearly caters his story to the character of Jane and her off the wall methods that have made her one of the most well-regarded campaign strategists in the game. Were Green to have not done this we would have little more than a standard political drama, but given the characters are fun and engaging it's impossible to not see it as at least a little more than that. their hearts content in Our Brand is Crisis. The film, which is actually a remake of the 2005 documentary of same name, is based on the American political campaign strategies used by the firm Greenberg, Carville and Shrum (GCS) in the 2002 Bolivian presidential election. In 2002, American-educated Bolivian politician Gonzalo Sánchez de Lozada hired Washington, D.C. based James Carville's political consulting firm to help him win the 2002 Bolivian presidential election. Carville used American political campaign strategies in the election to help Lozada surge ahead of Evo Morales in order to help him win. 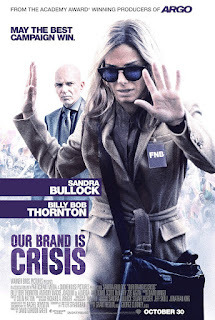 While there are similarities between this real-life story and the one told in Our Brand Is Crisis Bullock's character is completely fictional yet it seems Green and his team wanted to make a little nod to the source material by making Billy Bob Thornton go bald. In this version, Bullock is the campaign strategist who has long since retired from the game with only one reason big enough to pull her back in. Luckily, Anthony Mackie and Ann Dowd have what they need in order to get Bullock back in the ring to help them get their candidate, Castillo (Joaquim de Almeida), back in the Presidential race. This reason being that Castillo's opponent has also hired an American campaign strategist in the form of Pat Candy (Thornton) who just so happens to be Jane's sworn enemy. Jane has never won an election when facing off against Candy and despite her reluctance to return to the world of politics the thought of being able to beat Candy is too sweet to avoid and so we roll on. Jane shows up in Bolivia with Dowd and Mackie, meets the rest of the campaign team that includes Scoot McNairy's PR guy and intern Eddie Camacho (Reynaldo Pacheco) initially coming off as no good to the greater good of the team. Green, working from a script by Peter Straughn (The Men Who Stare at Goats), doesn't waste any time explaining such things as why Castillo wants to be President despite seeming to already be checked out of every conversation he takes part in, but instead accepts his candidacy as fact with nothing else to do but move forward. Jane seems to do the same despite voicing her opinion that she doesn't believe Castillo to be a winner. It's as if she too is uninspired to put forth any effort until he gives her reason to and unfortunately for the film, that doesn't occur until twenty-five minutes in. The character set-up and exposition is the tired, traditional part of the movie that it could have hacked off and explained in the opening credits, but this is no horrible offense as once things get rolling they continue to do so at an effortless pace that places the cutthroat world of political campaigns front and center. Digging into the politics of politics can certainly be messy and while Crisis presents so many double-crosses and backstabbings it could feel easy to get lost in the shuffle, Green and his actors keep things light enough it's easy to keep track of actions and alliances while consistently sticking to the oddball tone that feels inspired by something akin to satire. I don't know that you would technically label Crisis as a satire given more of it is probably true than most would care to admit, but it's certainly quick to point out the shortcomings of this vicious circle. That doesn't excuse the film from coming to what is likely too idealistic a conclusion, but for the majority of the time this is a riot of a film one would be hard-pressed to not have fun with. 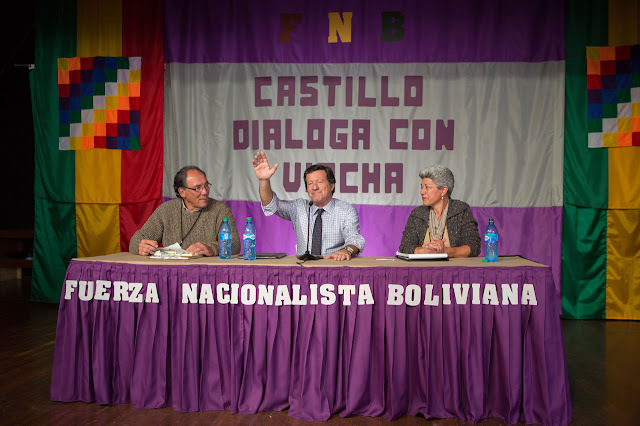 Castillo (Joaquim de Almeida) makes strides in his effort to be President of Bolivia after enlisting Jane for help. As I stated earlier, the distinctive feature is how well Green bends his narrative to fit his rather offbeat characters and it is those characters that really allow the script to thrive. It is easy to see how things might have turned out with a less charismatic cast, but Green is filled to the brim with charisma here and he has no problem coercing it out of his stars. Bullock is front and center and while she is essentially playing her Miss Congeniality character with a little more booze, she nails it. The amount of subtle, physical comedy (is that even possible?) is impressive in that it consistently comes as a surprise given the rather serious circumstances of the given situation. Furthermore, Bullock takes what could be considered rather flat inspirational speeches and turns them into rousing motivational talks that convince her troops she's worth her trouble. Thornton, on the other hand, is somewhat wasted in the role of Candy for despite the fact he's able to play "creepy old dude" in his sleep these days, he simply isn't given enough to do outside of verbally tormenting Jane any time she gets a leg up on him. McNairy stands out among the crowded campaign team as his entire mentality seems based off a single book he read about politics once in college. His thoughtless dork garners almost as many laughs as Bullock and does so without seeming to try. Zoey Kazan (Ruby Sparks) shows up at the request of Jane so as to background check their client and dig up any dirt on their opponent, but she too is under-utilized in a role that could have easily served a bigger purpose. Bullock's 'Calamity' Jane and the rest of her team understand they operate in a game based one hundred percent on perception and in accepting this reality the film also banks on our expectations of a certain thing while delivering something wholly unexpected and thus more stimulating than initially imagined. Our Brand Is Crisis has a lot of things that lend it a good perception whether it be the actors who star in it, the pedigreed indie director who typically garners favorable reviews on his smaller dramas or the team behind such successful awards contenders as Syriana and the aforementioned Argo, but while Crisis doesn't seem to have any such ambitions it still feels like a carefully observed film that never goes back on itself to discredit the wealth of trust we build in these rather unfavorable characters. My thoughts keep returning to what the film so easily could have been, but the fact that it isn't only stands to make it more appealing. Sometimes, a little surprise is nice and deserves a little cushion for going out on a limb even if it still may not be as great as it's potential led you to believe.